All ornaments currently for sale are listed here. To see separate listings of New Arrivals, Glass, Cotton, Paper, Candy Containers and Toppers, click on "One-of-a-Kind Ornaments". 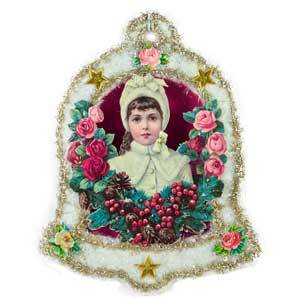 Each ornament is designed with antique and early vintage materials (ranging from 130 to 60 years old) and is carefully handcrafted from scratch as a brand new creation. Every ornament is a work of art and is hand-signed by artists Gail or Glenn Giaimo. We also can create custom ornaments just for you and can work within your budget and preferences. We would love to work with you; there is no obligation to buy! Request a custom ornament by clicking here!